Derma V10 Q10 Innovations Face Creams - Night* and Sensitive* approx £1.49-1.99. I'm going to be honest with you and I think some of you's out there may start screaming - however while recovering from my operation my skin care reigem is here there and everywhere. If I actually use toner on my face in a day - I'm having a good day. 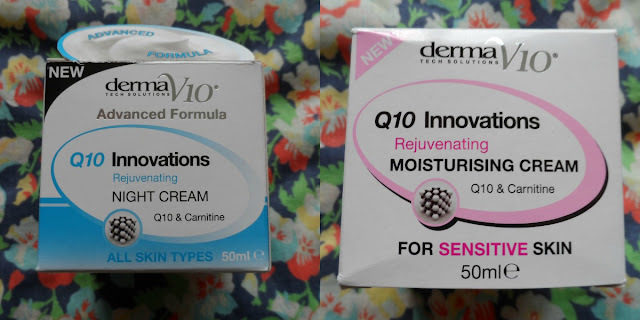 As I've been practically in bed for a good week and a bit I thought I would share with you two face creams I have been reaching for (literally from my sickbed). 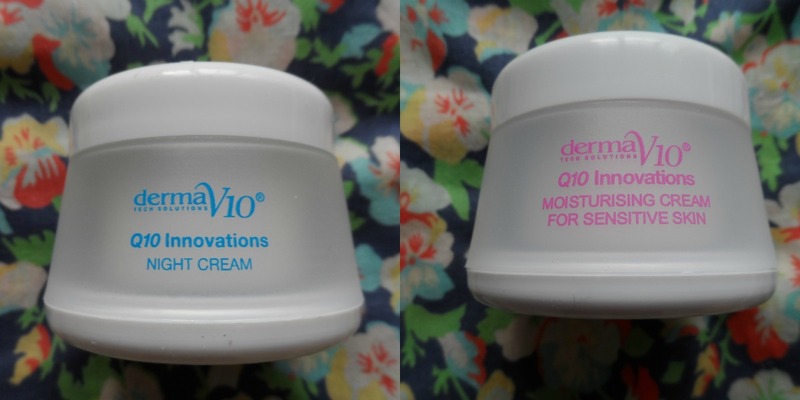 If you are a regular reader of the blog you will know that I have previously used/reviewed one of Derma V10's night creams (review here) and I have been on the fence about it. However when I recieved both the Night Cream and the Moisturiser for Sensitive Skin I decided to erase my prior experience with their face creams and go in with an open mind. I must point out I have only used the sensitive skin once twice as a certain mother has swiped it for herself while I was asleep. First up is the packaging - like the majority of all Derma V10 products the packaging is plain and very simplistic which doesn't bother me in the slightest. What I love about the Innovations range is the fact that all the products are sealed- one of my pet peeves is not knowing whether someone has previously opened/tested a product - however with these the foil deters that (as well as keeping the product fresh). I've found both products to work in exactly the same way - there is no difference in thickness/formulation and both do an excellent job of keeping my skin hydrated. The sensitive skin version isn't scented, so it won't agitate the skin and its a good product for men to use too. However I LOVE the scent of the Night Cream - it reminds me of a mixture of baby lotion and talc. Both creams absorb straight into the skin and the Night Cream leaves no scent. I do like a multi functional product and I have been using this on my elbows and as handcream some may say due to laziness however I call it research. Normally I purchase my DermaV10 items from Home Bargains, however you can also pick up the range in Bodycare and Savers. Prices range depending on which shop you go to, however I'm sure I spied this in my local Home Bargains for about £1.59 a tub. Just purchased the pink one for my daily use, looking forward to a good outcome.